www.nigerianbloggers.com is the only aggregator I am aware of that sort of unites “Nigerian bloggers, especially within the Nigerian Blogville Circle. Its the brain-work of Mr. Kayode Muyibi, a social entrepreneur and developer, and co- founder of Nairahost.com, a Nigerian webhosting company. I have “Nigerian bloggers dot com” bookmarked in my “daily must visit” sites, and I drop by daily, and very religiously. Several times last year, 2009, I observed that it went offline too frequently. For about a month now, I have observed that www.nigerianbloggers.com has gone persistently AWOL. I always had it at the back of my mind that perhaps it was the usual “downtime”, and very soon, issues would be resolved. As of this morning, it still shows a parked page. So I decided to do a little investigation, and discovered that there is a new owner: Mr. Sun Fen from China? and the domain was created on 09–Nov-09? for a project Mr. Kayode lauched in 2005? Its funny that “our very own domain name” is now in possession of a Chinese man? 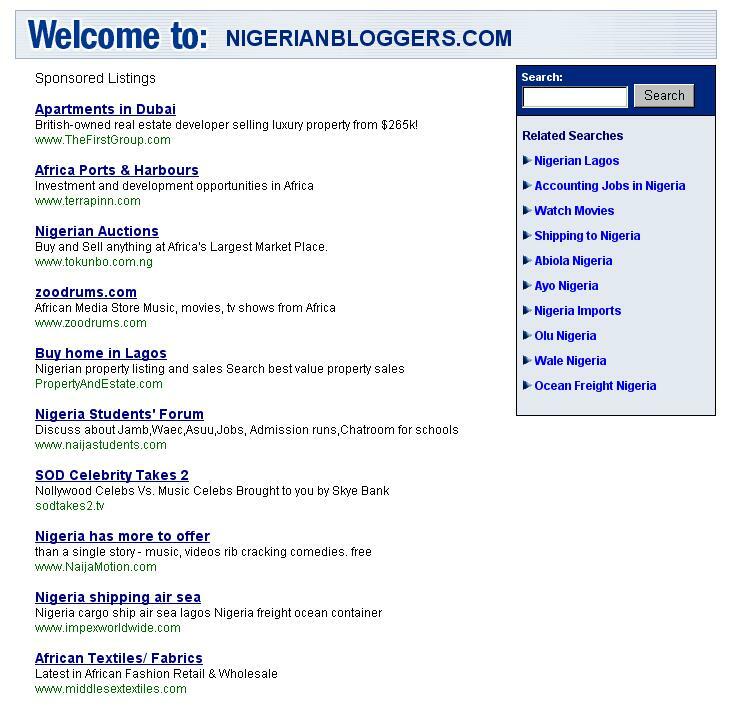 has nigerianbloggers.com become another forgotten project? was it the result of “buisness gone wrong” on the part of Mr. Kayode? was it sold to Mr. Sun Fen, coz it sure is a catchy domain name, and I won’t mind buying it if its for sale? or perhaps, Mr. Kayode Muyibi the former owner forgot to renew his domain and Mr. Sun Fen jumped in right on time? As you grow older, certain things become priorities in your life. You might think you have it all figured out, but sometimes you become deluded by the little success you have achieved in your endeavors. I would agree, that I am guilty of this, and I am working towards fixing my life fully with a focussed goal and a written plan in a business plan format. I tried to connect the dots: nigerianbloggers dot come now the propertyof a Chinese man plus Mr. Kayode’s own blog not updated since Apr 2009 plus whatever he meant by “certain things become priorities”……plus….. which also mean some other things take a back seat. I wondered if nigerianbloggers.com had become one of those things that has taken a back seat in Kayode’s life…..coz it sure was a great idea. Anyways, I went about reading another post on his blog, titled: getting paid to receive SMS. As of this writing, the lone and single comment by one Mr. Trae_z, of http://www.traedays.com/, and a customer of Nairahost.com, isn’t too palatable. Click image below to enlarge. 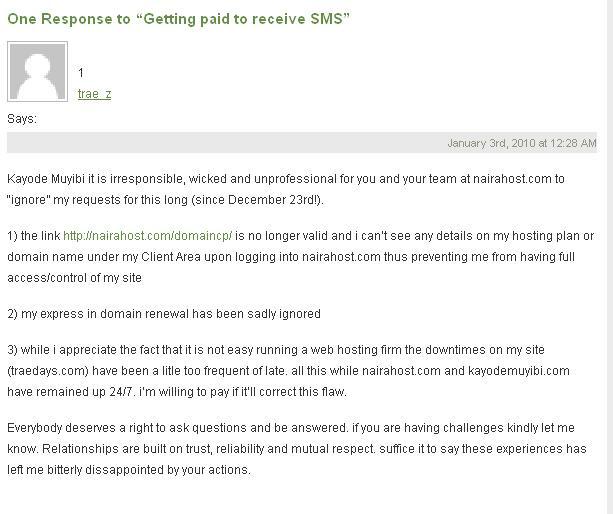 The comment, made on January 3rd has since not received any reply from Mr. Kayode(today is Jan 20th), either positive or negative: that the issue complained by Mr. Trae has been resolved, so comment kaput; or to refer Trae to the right channel for complaints: Nairahost. This leaves me concluding that Mr. Kayode hasn’t checked his own blog either. I would really like to know what happened to www.nigerianbloggers.com, and kindly, if you have info, please share. Enough of trying to connect dots together, let me safely assume that Mr. Kayode is busy with something else, and more important? And please, Mr. Kayode, kindly do your best to see that “our” nigerianbloggers.com sees the light of day, and that, soonest.